Neptune’s giant moon Triton is often called Pluto’s “twin” – so what better practice target, then, for New Horizons’ telescopic camera? New Horizons’ Long Range Reconnaissance Imager (LORRI) snapped several photos of Neptune during the latest annual systems checkout, which ended July 30. Neptune was 23.2 astronomical units (about 2.15 billion miles!) from New Horizons when LORRI took aim at the gas giant planet — and Triton made a cameo appearance in these images. Weaver points out that the solar phase angle (the spacecraft-planet-Sun angle) was 34 degrees and the solar elongation angle (planet-spacecraft-Sun angle) was 95 degrees. Only New Horizons can observe Neptune at such large solar phase angles, which he says is key to studying the light-scattering properties of Neptune's and Triton’s atmospheres. “As New Horizons has traveled outward across the solar system, we’ve been using our imagers to make just such special-purpose studies of the giant planets and their moons because this is a small but completely unique contribution that New Horizons can make — because of our position out among the giant planets,” says New Horizons Principal Investigator Alan Stern, of the Southwest Research Institute. Triton is slightly larger than Pluto, 1,700 miles (2,700 kilometers) in diameter compared to Pluto’s 1,500 miles (2,400 kilometers). Both objects have atmospheres composed mostly of nitrogen gas with a surface pressure only 1/70,000th of Earth’s, and comparably cold surface temperatures approaching minus-400 degrees Fahrenheit. 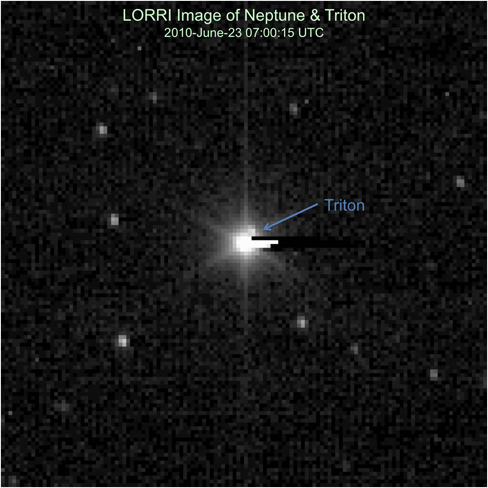 Triton is widely believed to have been a member of the Kuiper Belt (as Pluto still is) that was captured into orbit around Neptune, probably during a collision early in the solar system’s history. New Horizons first photographed Triton in 2008, during its second annual checkout, at a smaller phase angle (21.4 degrees) and larger distance (25.08 AU from New Horizons). New Horizons image of Neptune and its largest moon, Triton, taken during the annual checkout in late June 2010. The image, taken when the planet was more than 2 billion miles from New Horizons, is a combination of two 9.967-second exposures. New Horizons was actually closer to Pluto than it was to Neptune when these pictures were taken –a mere 14.92 AU (nearly 1.4 billion miles) from its main planetary target. Team members say a crowded observing schedule led them to skip observations of Pluto during this year’s checkout. But we will get another look at the planet before the July 2015 encounter – the mission plans to point LORRI toward Pluto in spring 2012.